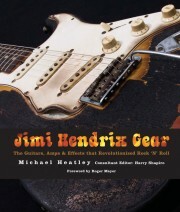 The first-ever illustrated book to catalogue, and review, the gear used by Hendrix over the course of his short but revolutionary career. Surviving guitars, effects and amplifiers are profiled in detailed cut-out photographs, while lost, destroyed and unavailable items are shown in pin-sharp contemporary images. Each of the chronologically arranged chapters begins with an overview of the period in question, and includes one or two special features that focus on a topic of particular interest. Photos of Hendrix on stage and in the studio, together with reminiscences from fellow guitarists, fans and music writers, complete this uniquely comprehensive picture of one of rock ’n’ roll’s master musicians. Foreword by Harry Shapiro (author of Electric Gypsy, the definitive biography of Hendrix), and interview with Roger Mayer, Hendix’s right-hand sound man.